i wish you all a joy and light filled holiday season! 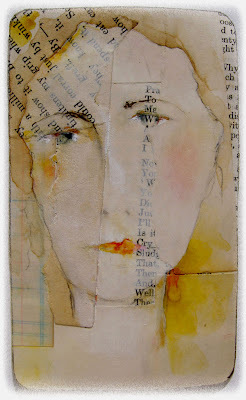 Fabulous Lynne love her and the quote by Whistler ...joy to u too..
very beautiful. i love the white - why does the white pop so much more on this portrait? it's nearly blue/white. happy christmas and all of that. So different from Holy Dolly, pensive, more gentle, perhaps not as sure of herself, beautiful too. Thank you Lynne for your warm wishes, plenty of the same to you! And a beautiful holiday to you too, Lynne. Peace and Joy to you too Lynne.....thank you for the golden light. Beautiful portrait as always. Have a wonderful Christmas Lynne! Really like the way the background is so visible in this piece. She is like a thought, present, but fleeting. Thank you for catching sight of her for us. 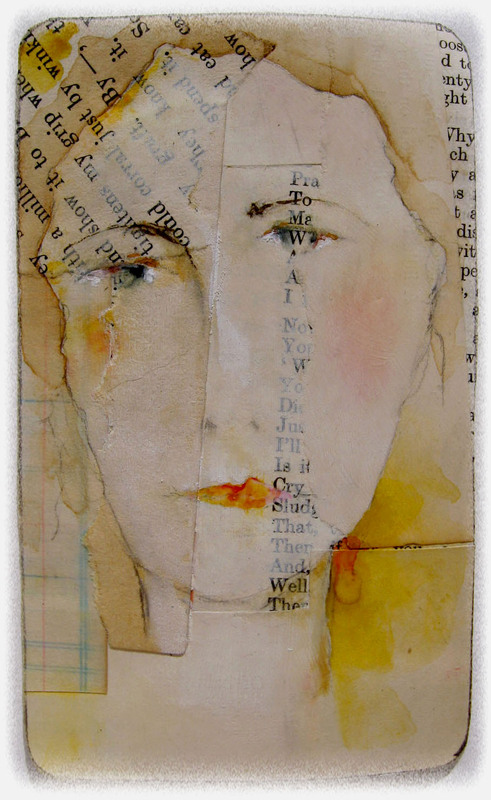 I love the look of your newest pieces will the collaged background and the bits of text coming through. Your faces always have so much personality and the freestyle background just adds to it. The happiest of holiday seasons to you! Same to you, Beautiful One. Light, love and peace ! Yes, much love and light to you, bringer of so much delight and joy! This one is a delicate beauty for sure. You are capturing something special on these cards. Love the quote, especially as it relates to our "hovels"! and Infinite blessings to you! Merry Christmas and red berries and holly and a million good things to you. I wanted to say thank you for your support and encouragement during the past year and for the enjoyment of seeing and sharing your work, which is always an inspiration. Wishing you A Merry Christmas from here in the UK. Lynn, I love that you leave your images big so you can see the detail when you click on them. The textures, layers, your lines, they feel so right, so comfortable, so real. I love your art so much, esp. the faces. Golden light girl, just speaks to me....I think she is ME! Happy art into the New year! !